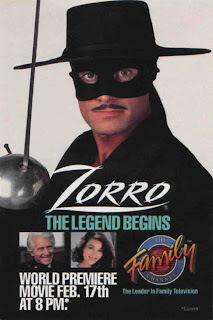 Spaghetti Cinema: Why a new Zorro TV series produced in Europe? The old Disney series [starring Guy Williams] hit the airwaves in France, airing on FR-3 in 1985, causing a nationwide sensation. Zorro fever struck France with a force equal to the one that captivated Americans during the heyday of Dallas. The Disney show aired in the most desirable time slot in France, Friday night at nine o'clock. The interest spilled over to merchandising. Kiosks featured new comic strip Zorro stories in Edimonde's Le Journal de Mickey. Products ranging from puzzles to chocolates to bedsheets and everything in between were marketed. Over the previous two years, John Gertz had been running the Zorro business part-time while he completed the coursework for his Ph. D. Nancy Larson continued screenwriting and was selected to attend the prestigious Sundance Institute to develop her film THE WIZARD OF LONELINESS. Gertz-Larson Productions had evolved into Zorro Productions, Inc. Now, two roads diverged before John. He could devote his energies full-time to reviving Zorro as a classic character, or he could write his doctoral dissertation. John took a year's leave of absence from school to see how he'd fare in the business world and saw the leave extend as he grew Zorro into a successful international property. My favorite Zorro is of course Guy Williams. Probably because he was the first Zorro I became acquainted with as a child. Second would be Duncan Regehr in this European Zorro series. Regehr was an accomplished swordsman so he added some great sword fighting to the series. This series also geared toward a younger audience portrayed Don Diego as a cultured Spaniard not a whimpy fop as in most productions. Nice to see the Texas Hollywood sets and an occassional face from the old Spaghetti Western days appear.